Use of the fire rune ability will level your skill in Destruction magic. However, it will not expend any magicka. Since the fire rune spell is so powerful as to warrant having one of the highest magicka costs of any non-continuous spell, this makes the rune hammer a very effective means of grinding that skill. The Dawnguard Rune Hammer is affected by the Destruction perk Rune Master. 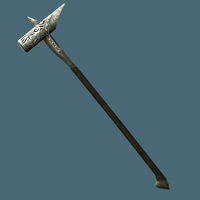 If you drop the hammer from your inventory, it will disappear completely. Putting the weapon on any weapon display furniture will also cause it to disappear. The hammer does not gain extra damage against vampires. The rune may not cast when bashing. ?